Are you Considering Getting an Online Degree? Are you Considering Getting a Online Degree? Why not receive your online degree at the world’s biggest online University Walden.edu? The number one most important aspect of Walden University is that it is an accredited institution. They have more than 40 years in higher education, 50 online degree programs with a wide variety of specializations and concentrations! 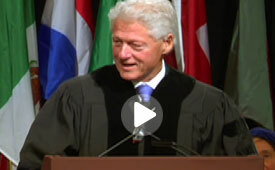 Former President Bill Clinton gave in the commencement speech in July 2011. I really enjoyed listening to it and the advice he gave the graduates. You can view it on the homepage at Walden.edu. This advice and information will forever be valuable to this group of now alumni. Walden University’s online degree programs range from certificate programs to bachelor degrees to master’s and even doctoral degree programs. A few years ago I took online courses for Web Design & Development. It is so wonderful to be able to set your own schedule at your own pace. If you are considering an online degree program, learn about Walden and Walden University’s online degree programs to see if it would be a good fit for you. I did receive compensation for this post, however all the thoughts were my own. Always wondered about online courses. i’d love to study from home and save all that time and money at the same time!